A few weeks ago I went cross-country skiing in Vermont at a place called the Trapp Family Lodge. The Trapp family is the inspiration behind the classic musical and movie “The Sound of Music”. We were attempting to sing this song in the car. This video shows the lyrics, not that it helps much. After a few hours out on their 60+ miles of trails, I have come to understand why NordicTrack claims “no other machine offers the calorie-burning, total-body workout of the original Classic Pro Skier”. Horsing around in front of the lunch lodge. At the end of the day, we hobbled to the gift shop, where I discovered that the Trapp Family Lodge features estate bottled Austrian wine. I picked up the 2008 Pinot Blanc from Höpler. Pinot Blanc is a white mutation of Pinot Gris, which is a lighter-berried version of Pinot Noir. It goes by Pinot Bianco in Italy, Klevner in Alsace, Beli Pinot in eastern Europe and Weissburgunder in Germany and Austria. This grape accounts for 6 percent of Austria’s total plantings and some argue it has its best expression here. When dry, it tends to be fuller-bodied, round, with medium to high alcohol, notes of almonds and the ability to age. The wine had notes of honey, musk melon, white flowers and fresh herbs. 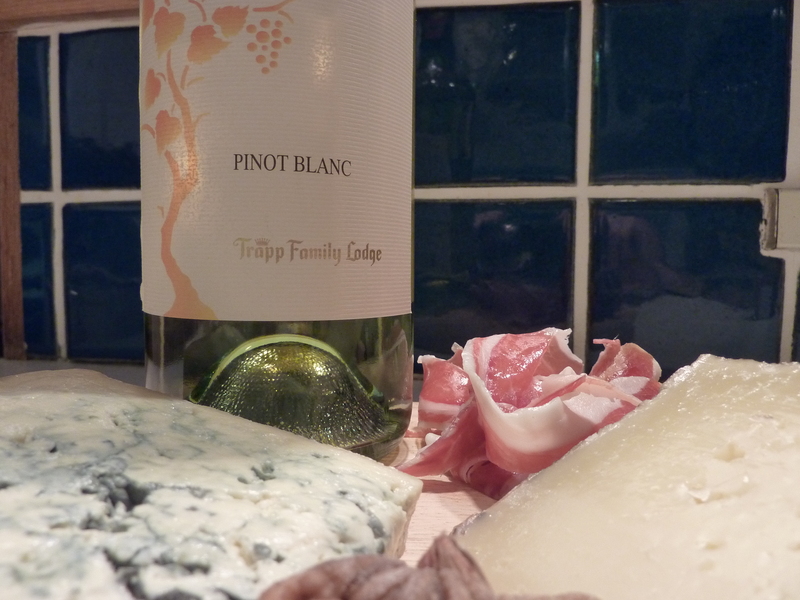 The back label suggested ossobuco of rabbit, but it did just fine with Serrano ham, Manchego and Bleu d'Auvergne. Leya oda lea oda looo.